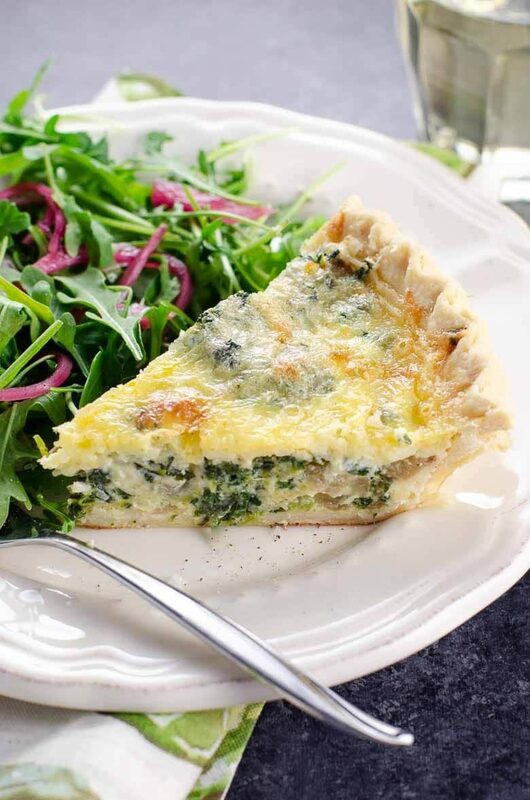 Our take on spinach quiche uses lots of spinach and Gruyere cheese. Use a vegetarian Swiss cheese instead of Gruyere, which is traditionally made with animal rennet, if you like. We bake the flavorful filling low and slow to make it tender and use a good-quality pre-made pie crust to keep this dish easy enough to make on a regular basis (or for a special occasion where you're making lots of other things, too). For a big party, buy a two-pack of pie crusts and bake this quiche alongside our Quiche Lorraine, right on the same rimmed baking sheet. Or keep it vegetarian and double this recipe. We are huge fans of entertaining with classic dishes that never go out of style. Quiche may feel more earnest to some and more retro to others, but it’s always a popular buffet item. 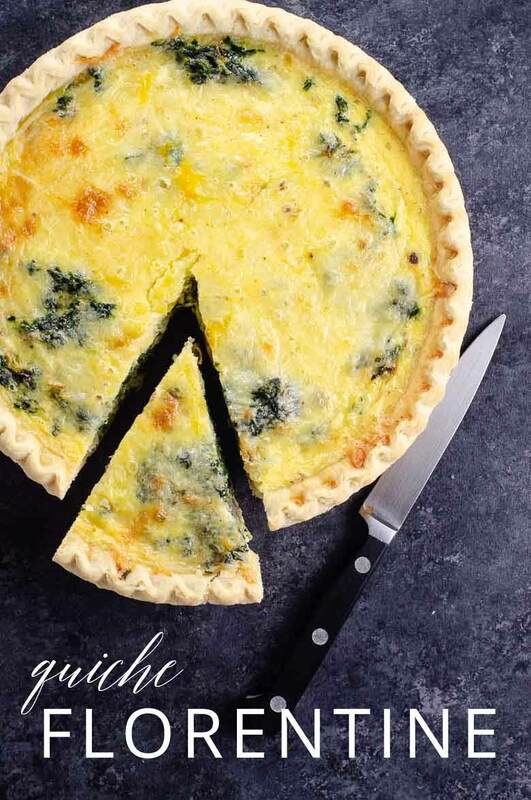 For a wedding shower or baby shower, Easter, Mother’s Day, and beyond, a good recipe for quiche will set you up for success. 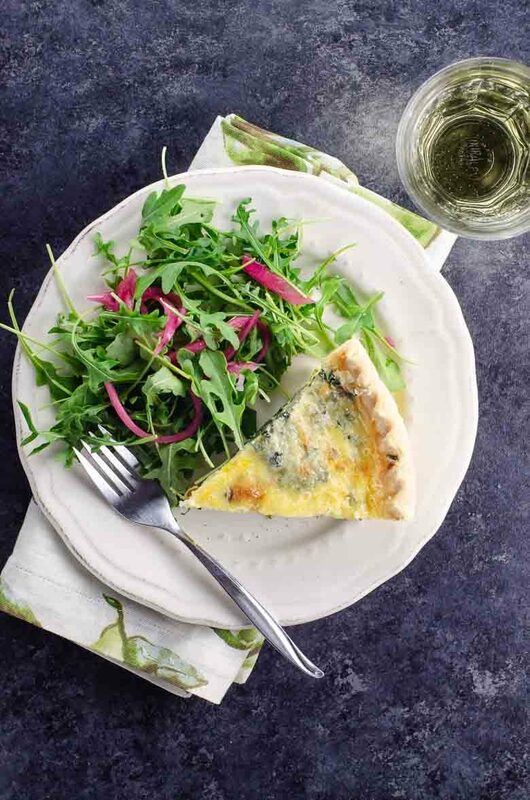 Pair Quiche Florentine with a good salad, a classic cocktail, and a jazzy playlist, and you’ve already got the makings of a crowd-pleasing party. Here’s a list of our best tips for making spinach quiche. You can find more details about some of these items below. Start with a really good crust, whether homemade or store-bought. See below for our frozen premade crust recommendations. We can be purists about some things, but we like the idea of starting with a good premade crust here so that you'll turn to this quiche more frequently. Frozen spinach is the right choice for spinach quiche. It’s inexpensive, nutrient-dense, and easy to work with. Ten ounces is one standard grocery-store box (or grab 10 ounces out of a one-pound bag and save the rest for another use). After heating the spinach in the microwave, squeeze out as much liquid as you can. This is an essential step for making the best quiche filling. Cut your onions nice and small. You can choose whether to dice them small or to slice them very thinly from root to tip. If you like, you can replace the onion in this recipe with two medium shallots. We prefer to use one cup of heavy cream and one half cup of whole milk in this recipe, to yield a nice, custardy filling. This method also has the benefit of using up a pint of heavy cream when you bake a Quiche Lorraine (or a second spinach quiche) alongside. A generous helping of good, aged Gruyere is the right cheese for spinach quiche if you don’t mind that it uses animal rennet. If you have a Trader Joe’s nearby, check there for high-quality Gruyere at a reasonable price. If you’d like to keep the quiche vegetarian, swap in a good-quality, full-flavored vegetarian Swiss cheese. Prebake (“blind bake”) the crust for ten minutes at a higher oven temperature to ensure the crust cooks through, stays flaky, and doesn’t get soggy. Bake the quiche itself low and slow to ensure the filling is tender. Don’t overbake the filling. Pull the quiche out of the oven when it’s still the slightest bit jiggly in the center. It will set further as it cools. 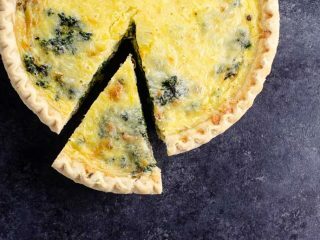 If you’re looking for a keto-friendly or low-carb spinach quiche recipe, you can bake this quiche without the crust by making the following changes. Spray a deep-dish pie plate with cooking spray or brush with 1 tablespoon melted butter and spread the spinach mixture and shredded cheese on the bottom. Add an additional 1/2 cup whole milk to the filling. Bake as directed starting in step 9 of the recipe. Replace the onion with a thinly sliced leek and the spinach with about a cup of chopped pencil-thin asparagus. Sautée the leeks until softened but not browned, and add the chopped asparagus to the skillet for two to three minutes when the leeks are nearly done. Replace all or half of the spinach with sautéed mixed mushrooms. Caramelize two or three very large, thinly sliced onions for a classic tarte a l’ognion. Try a Caprese tart with sautéed cherry tomatoes, julienned basil and fresh mozzarella. Top with thinly sliced tomatoes and a ball of burrata if you like. Soft herbs make a great addition to a vegetarian quiche. Try chives, tarragon, parsley, chervil, sorrel, dill, basil, or a combination. Other good, flexible cheese options include feta, sharp cheddar, parmesan or pecorino, fresh goat cheese, taleggio, and regular or smoked gouda. Spinach quiche is a delicious, classic vegetarian quiche option. Our version uses a good-quality pre-made pie crust to make this dish more routinely achievable. It's generous with the spinach and cheese without being unreasonable. If you like you can bake two, or bake it alongside our Quiche Lorraine, on the same rimmed baking sheet to serve a crowd and use up a two-pack of pie crusts. Quiche is even better the next day, so it's great to make in advance for a party or for a few nights' worth of dinners. To cook the spinach, place it and two tablespoons water in a microwave-safe, lidded container and cook on high until just hot, about four minutes depending on your microwave. When cool enough to handle, place spinach in a fine-mesh strainer and press out all the liquid you can with a fork or spoon, or with your fingers. While crust bakes and spinach cooks, warm olive oil in a medium-sized frying pan over medium heat. Add onion and cook, stirring occasionally, until softened, about five minutes. Off the heat, add drained spinach and 1/4 teaspoon salt to pan and use a fork to mix the spinach and onion together thoroughly. In a medium bowl, beat eggs well with a fork. Add cream, milk, remaining 1/2 teaspoon salt, nutmeg, cayenne, and black pepper and mix until well-combined. Gently spread spinach mixture and cheese evenly over bottom of crust. Open oven and pull out rack enough to set the partially filled crust (still on rimmed baking sheet) onto the rack. Carefully pour the egg mixture into the crust. It will be very full. Gently slide rack back into place. Bake until filling is just set and still slightly jiggly but not sloshy in the center, 30-40 minutes. The center will firm up as it cools, and pulling the quiche out at this stage will prevent it from getting tough. Let cool for at least 10 minutes before serving, preferably longer. Quiche is even better the next day. We like Wholly Wholesome traditional organic pie crusts from the freezer section of Whole Foods. Just be sure to use a good-quality crust that doesn't taste too sweet. Quiche does not want a sweet crust. If you want to eliminate any chance of the crust puffing up while it blind bakes, you can line the bottom with parchment and place dried beans overtop. This isn’t usually necessary for frozen crusts, which tend to have less dough than homemade crusts. If your crust puffs slightly while blind baking, just gently tamp it back down after it cools for 10 minutes. Traditional Gruyere is made with animal rennet and isn't vegetarian. If it's important to you that this quiche be vegetarian, find a deeply flavored Swiss-style cheese that's made with vegetarian rennet.